These are items that are available through this site. They include the book this site is based upon, a program for planning a trip, backpacking items, journals and other things. Just scroll down through this page to see what is available. They can be ordered online with a credit card through Paypal (you do not have to have an account). All physical orders are typically mailed within 1 to 3 days and all software orders are typically sent on the same day (unless we are on the island!). If you order an items to be mailed, you will receive an email confirmation when your order is received and another one when it is shipped. NOTE: We will be gone with no internet access from May 4th until May 15th, 2018. Any orders placed between then will be processed on our return. Sadly, we will not be on the island due to the cancellation of boats. On the plus side, we will be paddling the Au Sable River! Page Menu - Select item to go directly to it or, scroll down to see everything available. The book contains over 225 pages of detailed information on the park with about 350 color photographs and over 275 detail maps and charts. It is available in 6 different price packages based on the format selected. It is set up this way to allow you to choose based on your interest in the island and your need for details (maps, etc.). The PDF files include all of the pictures, overview maps and scaled topographic maps in a small size to fit on the page. The "Ultimate" version not only has all of previous, but all of the pictures and overview maps link to a larger version and all of the detail maps link to a full page formatted map in either 1:12000 or 1:24000 scale. 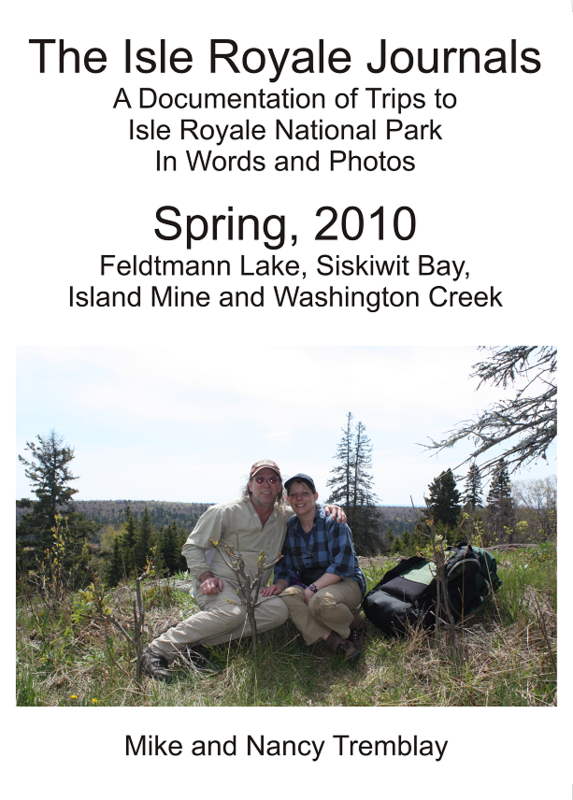 For a complete description of the book, select "Isle Royale Info Book" then book description from the main menu. For a complete description of the supporting program, select "Isle Royale Info Book" then program description from the main menu. The "Ultimate" package is the package I recommend to most everyone because it has everything. The full page detailed topographic maps are the only maps you will need to get around. I usually print them out and "laminate" them with some cheap clear contact paper and this protects them unless they are soaked. I have found that once people start exploring the island, and especially after they get back, they want to know more and I recieve requests for uprades to the "Ultimate" once they return and start planning their next trip. Another thing to keep in mind is you can order any two "Trip Packages" at anytime after purchasing the "Ultimate" package. The complete printable PDF file containing the entire book. All of the pictures and detail maps are included in the book in small form, but the links to full size photographs and larger detail maps are not included. The "Base Camp" and "Trip Planner" programs are NOT included. This package is intended for those just wanting to know about the island. If you are planning a trip to the island, you should look at the "Basic Plus" Package as it gives you planning tools and the option to upgrade to a higher package in the future. The PDF file can be read on a computer, loaded onto an electronic reading device, or printed. When ordered, you will will receive an email with the PDF file attached to it. Sorry, there are no upgrades available with this package after your purchase because it does not include the program to upgrade. The complete printable PDF file containing the entire book. All of the pictures and detail maps are included in the book in small form, but the links to full size photographs and larger detail maps are not included. It also includes the "Base Camp" and "Trip Planner" programs. The programs are fully functional with the exception of getting chapter updates through the "Base Camp" program. This package is intended for those planning a trip to the island once, but do not need larger detail maps, photos and updates. When ordered, you will be emailed the PDF document, your license number and a link to a page to download the installation program. The installation program will install both programs and the entire book. If this is done, there is no reason to download the PDF file as it is installed as part of the program. The PDF only file is provided for those who do not want to install the program.upgrade. The same as the "Basic Plus" Package with the inclusion of lifetime updates. This will be a "living" document as long as I am alive and will be continually updated. The "Base Camp" program offers a selection on the menu to "Check for Chapter Updates". The program will then go online to the Isle Royale Info server and check to see if there is an update for any of the chapters. If there is, you can automatically download the latest versions through the program. It does not include the links to larger pictures and the detail maps like the "Ultimate" version. This package is intended for those planning a trip to the island, or have been there and plan on going back and want the latest information as it changes. When ordered, you will be emailed the PDF document, your license number and a link to a page to download the installation program. The installation program will install both programs and the entire book. If this is done, there is no reason to download the PDF file as it is installed as part of the program. The PDF only file is provided for those who do not want to install the program. If you do not install the program, when any major update is completed and released, you will be notified via email and a link will be provided to download the newest version. The "Ultimate" package is the same as the "Lifetime" Package, with the inclusion of links from the document to the larger photos. All large maps and detail maps are also linked to a larger version of the map. This is truly the package that will give you everything you need to plan and take a trip to the island. Having the full size pictures give you a much better view of the island and the larger detail maps are printable and can be taken with you on the trip. The "Base Camp" program offers a selection on the menu to "Check for Chapter Updates". The program will then go online to the Isle Royale Info server and check to see if there is an update for any of the chapters. If there is, you can automatically download the latest versions through the program. It will also check for updates to the larger pictures and maps, and optionally, download those updates if available. When ordered, you will be emailed the PDF document, your license number and a link to a page to download the installation program. The installation program will install both programs, the entire book and all of the larger pictures and detail maps. If this package is ordered, you can also select any two "Trip Packages" listed below for free. Once you decide which ones you want, use the contact form to request one or both. The "Mac" package is for Machintosh users who cannot run the programs. You will receive an email with the the PDF file attached and mailed a CDR in a "fancy" case. The CDR contains the entire book in PDF form with links to all of the larger photos. All large maps and detail maps are also linked to a larger version of the map. I offer a printed copy, but it is printed by me at home. Thus the high price as it is time consuming and is hard on my printer and ink. This is a living document and to mass produce it at a printer would defeat that purpose. Also, the document is currently about 230 pages at 8.5" x 11" in size with full color pictures, so the cost is very high for printing unless it is done in large quantities. Even then, it would still be too high in price. The whole idea is to share this information with people and keep it up to date. If you can print it at home, order the basic package and print it out yourself if you want a hard copy. If you cannot and want a hard copy, you can order one and I will print it. It will come in a three-ring binder. Please allow for at least 7 days for me to print it and organize it as it is time consuming. To keep the cost down, it is mailed "media" mail so it might be as long as two weeks before you receive it. If you have purchased the "Basic Plus", "Lifetime" or "Ultimate" packages and you wish to have a CDR with the all of the programs, documentation and PDF files mailed to you on a CDR in a "fancy" case. If you have purchased the "Basic Plus" or "Lifetime" packages and you wish to upgrade to a higher package. Once purchased, you will be emailed your upgraded license number. Then start the "Isle Royale Info - Base Camp" program select "Help Me" > "Get a New Permit (Upgrade License)". You will be prompted for the license number and the program will go online to verify the license. Once verified, the program will upgrade the package. 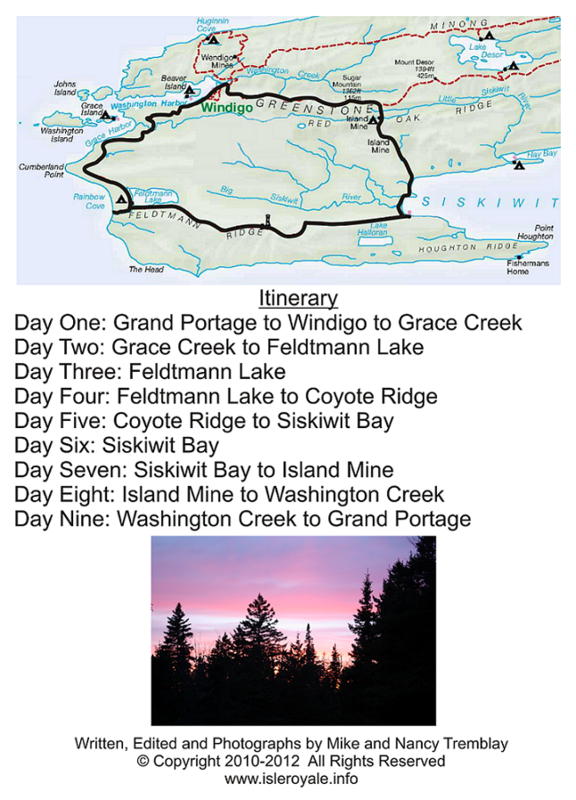 This program was created to help you plan your trip to Isle Royale National Park. It will create and save an Itinerary based on your selections, allow you to load and view the itineraries you have created, create and print a permit based on it and generate a trip package with information on the trails and campgrounds along your route. For a complete description of the program, select "Itinerary Generator" then program description from the main menu. Note, the program is only available for Windows. For people who have purchased the "Ultimate" package previously, the Itinerary Generator Program is available at a discounted price. Order it below and we will send your license as soon as we verified your "Ultimate" license. Everything needed to plan your succesful trip to the island! Included are: The Isle Royale Info Book - Ultimate Package, The Itinerary Generator Program and all available Trip Packages. The Isle Royale Trip Packages are complete packages for common routes on the island. The packages are compiled from details in the book. If you order the book, you get essentially the same information except for the sample itineraries and trip maps. Also, if you order the "Ultimate" package of the book, any two of these packages are included for free. They were created in response to the most common question I receive, "What route do I choose?". These are meant to aid in determining a route, then getting full details of that route once decided. Each package provides details on the route including maps, pictures, trail descriptions, campground descriptions and details on some points of interest. For a complete description of the packages, select "Planning Tools" then trip packages from the main menu. Note, the packages are only available in the direction described. When ordered, you will will receive an email with the PDF file attached to it. The PDF file can be read on a computer, loaded onto an electronic reading device, or printed. This allows you to take the details for the entire trip with you. The Feldtmann Ridge Loop - This package is described counter-clockwise from Windigo to Washington Creek. It is 26 pages with 8 full page 1:24,000 scale topographic maps, 10 trail detail maps and 40 color pictures. The Greenstone Ridge Trail - This package is described east to west from Rock Harbor to Windigo. It is 61 pages with 12 full page 1:24,000 scale and 7 full page 1:12,000 scale topographic maps, 31 trail detail maps and 74 color pictures. The Minong Ridge Trail - This package is described east to west from McCargoe Cove to Windigo. It is 26 pages with 7 full page 1:24,000 scale and 1 full page 1:12,000 scale topographic maps, 11 trail detail maps and 36 color pictures. The Rock Harbor Loop - This package is described clockwise from Rock Harbor. It is 41 pages with 7 full page 1:24,000 scale and 6 full page 1:12,000 scale topographic maps, 20 trail detail maps and 57 color pictures. The Washington Harbor Area Paddling - This route takes indescribes the area and campgrounds in Washington Harbor and the entry of the harbor at the western end of the island. It is 16 pages with 5 full page 1:12,000 scale topographic maps, 5 water detail maps and 29 color pictures. 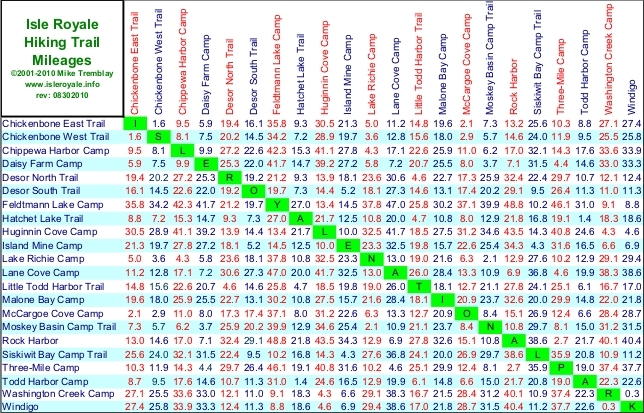 A laminated chart of Hiking Trail Milelages. Created based on the 1994 Trails Illustrated map data. It was originally released in 2001 and has since been cross referenced and revised in 2012. 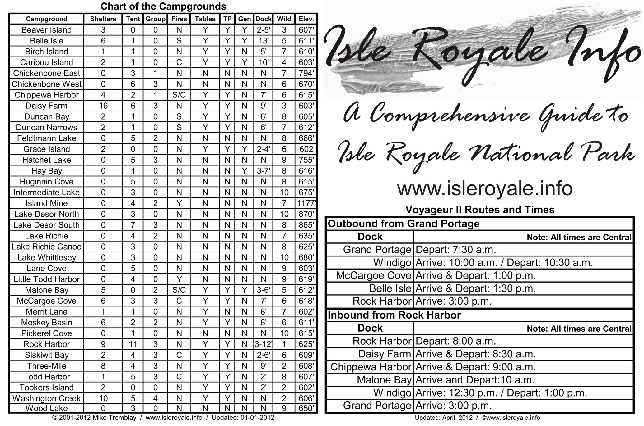 The mileage chart is the same one available in the "Isle Royale INFO" book, only laminated. Included in this laminated version, on the back side, there is a chart of the campgrounds with details on each one and a schedule of the Voyageurs arrival and departure times at designated stops. This is very handy to carry while on the island for planning routes and changing your itinerary on the fly. The Voyageur routes and times are key if you decide to get picked up somewhere along the way due to a route change or problems. These items are practical and lightweight backpacking items designed by Nancy Tremblay based on items we use on the trail. They are hand-sewn and made of no-see-um mesh with a velcro strip for closing. They each come with a hook to keep them handy by attaching them to the inside of your pack when walking and to clip them onto the inside of your tent when in camp. Backpacker's Cupboard - This is a 3 compartment personal storage container. It was designed to hold toiletries (not included:-) and personal items, but has many uses. It is 8" x 12", easily folds in half to save space and weights less than a half ounce! Backpacker's Drawer - This is a one compartment storage container. It can hold many things you need to keep handy like first-aid stuff, flashlights, emergency blanket, etc. It is 6" x 6" and weights less than a quarter ounce! Backpacker's Pocket - This is a mini pocket for those small things you perpetually use during the trip. I use mine to keep chapstick, a lighter, some gum and a toothpick. I have attached a loop to the inside of my front right pocket on my pants and I hook this to it. That way I can pull it out, open it and take out what I need, then just drop it so it dangles there. Then I use what I took, put it back in, then put it back in my pocket. Then I do not have to worry about dropping stuff or putting it back in. When going into the tent in the evening, I unhook it and hook it to the tent so it is handy during the night and in the morning. It is 4" x 3" and weights less than a quarter ounce! Backpacker's Kitchen Package - All of the above items together for one price! A cupboard, drawer and pocket. Total weight for all three is 0.7 ounces! The Isle Royale Journals are the notes taken while visiting the park, along with the stories of the trips. They are taken directly from the journals maintained while on the island. As part of my journals, I record details on the trails or water routes, campsites and other details. These for the most part, are not included in these journals. They are used in my document, "A Comprehensive Guide to Isle Royale National Park". For complete detailed descriptions of trails, campsites, places and basically everything you need to know about the park, that is the document you need to get. Downloadable PDF - You will receive an Email with the PDF file attached. This is the complete document with printable text and color pictures in thumbnail form, but without workable links to the full size pictures. Mailed CDR - In addition to being emailed the PDF file, You will be mailed a CDR with the PDF file and all of the hi-resolution photographs. The photographs are linked from the document and, when clicked on, the full size picture will load. It is packaged in a DVD case with a full color jacket, as shown in the photos below. This journal covers a trip made walking the Feldtmann Ridge Trail to the Island Mine Trail then, the Greenstone Ridge Trail back to Windigo. We came from Grand Portage, Minnesota on the first boat of the year aboard the Voyaguer II on May 2nd and returned on May 16th. On the trip was Myself and my then, girlfriend Nancy Hudson. This is actually two journals in one, as it combines both of our independent journals into one document. It provides two unique perspectives on the same trip. It was also Nancy's very first trip to the island and, I proposed to her at Rainbow Cove. It is 66 pages with 142 color pictures. Click here for a sample of the journal. "When I began reading your I.R. journals I expected to hear a lot about rocks, moose, wolves, wind and water. What I did not expect was to be riveted to your stories with tears in my eyes over your proposal and acceptance and the rest of your adventures. I feel blessed that you shared it with us." Jim F.
This journal covers a trip made canoeing the Duncan Bay area staying at Duncan Bay, Duncan Narrows, Rock Harbor and an overnight hike to Lookout Louise. We came from Copper Harbor aboard the Isle Royale Queen IV on September 22nd and returned on September 29th. On the trip was Myself, Roger Kuras, Aaron Kuras, Michael J. Tremblay and Bob Kuras . It is 24 pages with 56 color pictures. This journal covers a trip made canoeing the Rock Harbor area staying at Tooker's Island, Caribou Island, Rock Harbor and a day hike to Lane Cove. We came from Copper Harbor aboard the Isle Royale Queen IV on September 21st and returned on September 28th. On the trip was Roger Kuras, Bob Kuras, Michael J. Tremblay and myself. It is 23 pages with 61 color pictures. The 2007, 2008 and 2010 journals are available as a package at a discounted price when purchased together. They come in the same packaging as when purchased individually and will be mailed together. This site is not affiliated with Isle Royale National park or any official or commercial organization. All information presented is to the best of my knowledge. All photographs and text are Copyrighted and may not be used in any form without permission.